The latest threat from the government shutdown might be coming from the ringing of your cell phone. 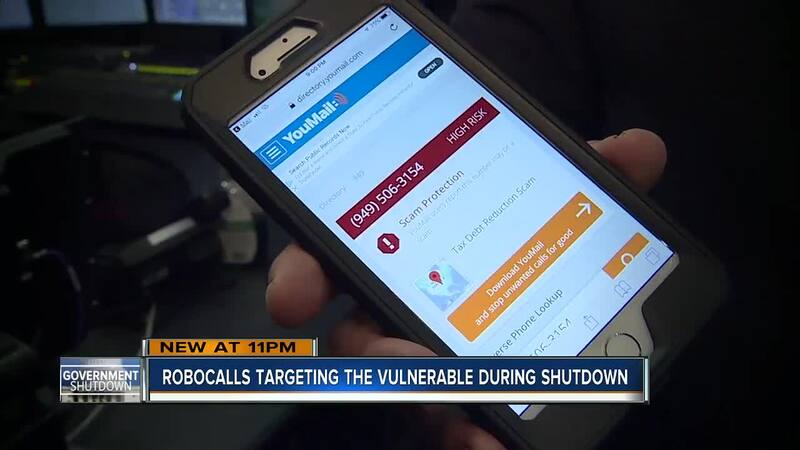 “Different areas can see surges or decrease over time as a particular robocall campaign may decide to target Tampa, Orlando, and Miami,” Alex Quilici the CEO of YouMail said. Quilici said they don't see a decrease or increase in the estimated 5-billion robocalls Americans receive every month. But Quilici says potential fraudsters might target more vulnerable populations. Phone scams result in more than $350 million in financial losses annually, according to Consumers Union. As long as the government is shut down, there are no federal agencies like the FTC or FCC to go after scammers. There are three things Quilici said you could do to protect yourself. First, don’t answer phone numbers you don’t recognize. Second, sign up for a free service to block robocalls in the first place. And third, don’t call a number back that you don’t recognize. If you want to call the number you should Google it first, verify it is legitimate.